Back in the 1980's there was a lot of talk about creating a "paperless office". Well, obviously this didn't sit well with paper and printer manufacturers, and the idea was quickly quashed, though some are still hopelessly waiting. Now although we may not have a completely paperless office, we may have the next best thing, a completely wireless office, almost. Now the word "wireless" doesn't excite people as much as it did five years ago with nearly every piece of technology offering something wireless. The first thing to go wireless in the average office was the router followed by the inkjet printer. Then Apple came barreling in with Bluetooth with the Mac OS X supporting it since version 10.2 and new Macs coming with it already built in. There are three main types of wireless devices you should know about: Wi-Fi, Bluetooth and wireless USB. Wi-Fi is a short range, high bandwidth connection, meaning it only covers a few thousand square feet. The good news is that it will carry a lot of information. Bluetooth is a short range, low bandwidth connection. It has good signal strength but will not carry a lot of information or data. Wireless USB is also a short range, high bandwidth connection whose signal drops steadily the farther away from the source you get. The good thing is that none of these things need a direct line of sight from your PC to the device itself. This allows for greater flexibility in placement and office logistics. While your stacks of paper seem to be getting bigger, you can now equip your office without the need of a "Medusa" -like tangle of wires and cords. Now you have a wireless office, almost. You will still need those blasted power cables, but with all the new wireless tech you have installed, you have cut the space taken up by wires, cords and cables by at least half. Heck, you may not even need power cables for much longer if people get wireless power up and running (seriously......you can't make that up). While having a completely wireless office sounds like the perfect setup, I think it is only fair that I put that dream on the shelf with my hoverboard and light saber, at least for now. The future holds bright and promising things, especially in the business market. So keep your eyes peeled for the latest installment in a wireless office, because it will only get you one step closer to the heavenly office you have been dreaming of for oh so long. In need of a PC Server Rental? If so, then call Rentacomputer.com at 800-736-8772 to schedule your own PC Server Rental. Seems that convention centers and hotels overcharge for just about everything these days. I have paid $100 for a folding chair that was worth about $25! I have seen centers charge $3000 for a two day plasma flat screen rental ($1500/day) and $1600 for an internet connection. Outrageous I say! Outrageous because the convention center can charge what it wants. Some convention centers even make secret deals with AV and Computer Rental companies. In these deals, the Convention Center gets a huge cut, often 100% Markup on the technology rental company's base price. Plus the technology rental provider has to pay a huge up-front fee, just for the privilege of providing their capital equipment to the convention center. You have to pay. These 'back room' deals have the effect of keeping out competition which keeps prices artificially higher than those convention centers who are open to the best technology service providers. You end up with crappy equipment you that you way over paid to have. With some Convention Center getting a huge cut with no competition, many convention organizers and trade show exhibitors pay double or even triple the 'real' market rate for Plasma Flat Screens, Projectors, Sound Boards, Mics, Speakers, Staging and more. Truth be known, 'unofficial' technology rental companies get in anyway, as they should. I won't tell you how, but the Tech Army Membership is an industrious techie group. They have come up with many creative ways to get product to patrons at 'reasonable' market prices, wherever the venue. If you rent a plasma flat screen from an Official Jacob Javitz Vendor, you are likely to pay double the price over what these 40 other companies would charge. Plus, where do you think the 4 'official' vendors get their inventory and extra labor? That's right, from the 40 'unofficial' av technology companies. The convention center want's its cut and gets it because they try to channel all transactions through their 'Official' Vendors. I'm not saying Jacob Javits is bad or doing anything wrong, but.... the tactics a bad convention center would employ may be considered anti-competitive because of 'exclusive dealings' and some agreements can even utilize collusion to get the deal done. At least one Tech Army Member rental company has changed verbiage on their Jacob Javits Rental Page. Due to pressure from companies wanting to select their own vendor for computer rentals and av equipment, many convention centers are no longer being exclusive by allowing only certain companies who pay huge fees, both upfront and on every deal. Convention centers are offering a disservice to their clientèle while lining their pockets with the premium payment for AV and Computer Rentals. Its time that independent Audio Visual and Computer Rental companies unite with a voice for fair, free competition. A voice united in breaking down the illegal trade obstructionist policies by some convention centers and hotels. This includes Las Vegas too. 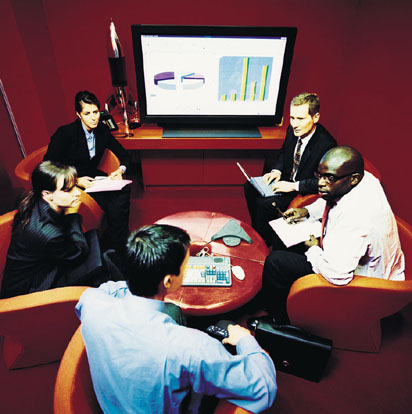 Many hotels and convention centers have their own 'in-house' av. But they allow 'certain' companies the privilege of taking care of hotel clients. That privilege isn't completely free, if you get what I am saying. We will be recommending to all our clientèle 'FREE TRADE' venues. Hotels and convention centers that want what is best for everyone. Whether you need a short-term rental, or a long-term lease we have the right kind of server for your needs.. The Jacob Javits Convention Center is one of the largest and most prominent convention centers in all of New York City. 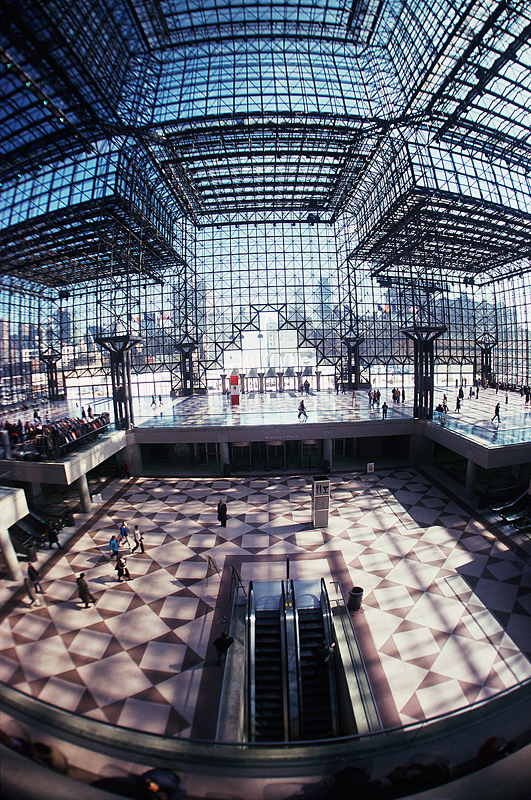 Located on the west side of Manhattan, the Jacob Javits Convention Center is a 675,000-square-foot center sporting the unique space frame architecture and design. The center itself is currently one of the largest centers in the country. However, renovations to the center, scheduled to be completed in 2010, will expand the building making the Jacob Javits Convention Center the 5th largest convention center in the United States. Every year, Rentacomputer.com provides thousands of vendors, exhibitors, guests and personnel with any type of computer or technology rental they could possibly need. Rentacomputer.com has everything from high-end desktop computer rentals and laptop rentals to projector rentals and even copier rentals. If a plasma screen is what you need, then Rentacomputer.com can have it delivered locally by one of their 110 local area technicians. A local tech will then install and test all of your equipment for you to ensure that it is all running up to speed. Needless to say, Rentacomputer.com has everything you could possibly want in a Computer and AV Technology Rental. And getting one is super fast and easy as well. 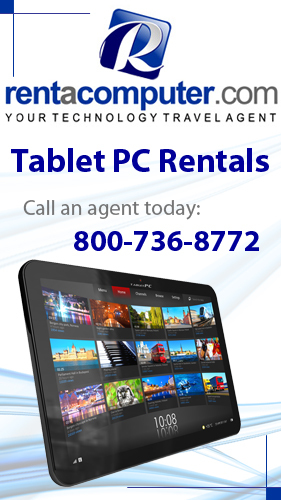 All you have to do is check out Rentacomputer.com online to get a fast and easy online computer rental quote or give us a call at 877-422-1907 to speak with a Tech Travel Agent. So if you are planning on attending the Jacob Javits Convention Center or any place in the surrounding area, then check out Rentacomputer.com for all your computer rental needs. 2- Office equipment rentals can be expensed so you avoid the ongoing financial burden of accounting for and depreciating expensive assets. 4- Office equipment rentals are the fastest way to get your office back up and operating after a disaster. With a full range disaster recovery service your Tech Travel Agent can provide the hardware and the technical expertise your business needs during tough times. 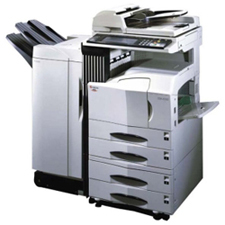 Office Computer Rentals, Office Copier Rentals, Office Fax Machine Rentals, Office Printer Rentals, Office File Server Rentals, Office Laptop Rentals, Office Monitor Rentals, Office Projector Rentals and more!